Hundreds of activists representing over 60 indigenous organizations on Monday staged a protest in front of chief minister Sarbananda Sonowal‘s residence in Dibrugarh seeking withdrawal of the Citizenship (Amendment) Bill, 2016. The Bill seeks to grant Indian citizenship to persecuted non-Muslim immigrants of Bangladesh, Pakistan and Afghanistan who migrated to the country till December 31, 2014. The protest jointly organised by the Asom Jatiyatabadi Yuva Chatra Parishad (AJYCP) and Krishak Mukti Sangram Samiti (KMSS) was supported by several other organisations whose members came out in large numbers to express solidarity to the anti-Citizenship (Amendment) Bill movement. The protesters took out a motorcycle rally across the town and converged in front of chief minister Sarbananda Sonowal’s residence located at No 1 Lakhinagar Road here. Holding placards and banners, the protesters raised slogans against the BJP-led government accusing it of betraying the people of the state by supporting the controversial bill. 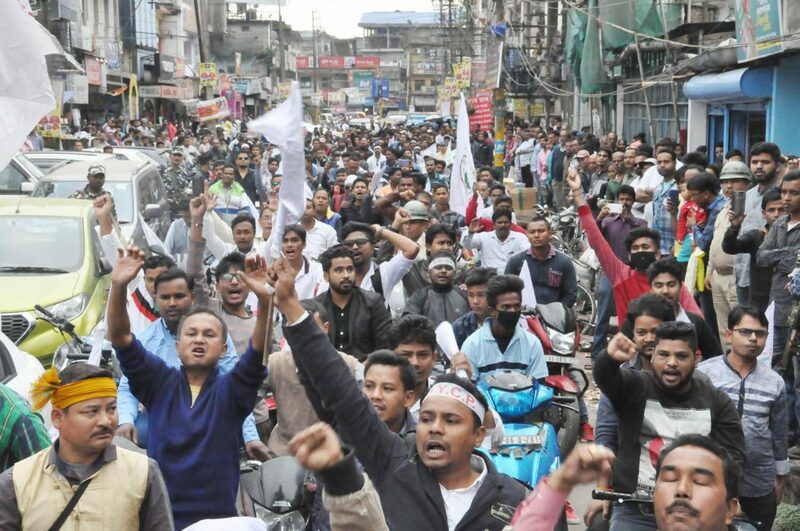 The KMSS leaders also came down heavily on chief minister Sarbananda Sonowal accusing him of remaining a mute spectator when the entire state has been opposing the anti-Citizenship (Amendment) Bill. The police later arrested six protesters for violating section 144 of the CrPC.